Halloween is almost here and since I’m so behind on posting, I wanted to hurry up and share a card I made this month using the holiday hostess set called Warmest of Wishes. I normally don’t get halloween stamps but since this adorable trick or treating owl was a part of the set, I knew this year I had to make at least one Halloween card! I actually got the card layout idea from the October issue of Stampin’ Success (the free monthly magazine sent to all SU demos – see another fun perk of being a demo!) But I had to play with it and add my own touches. 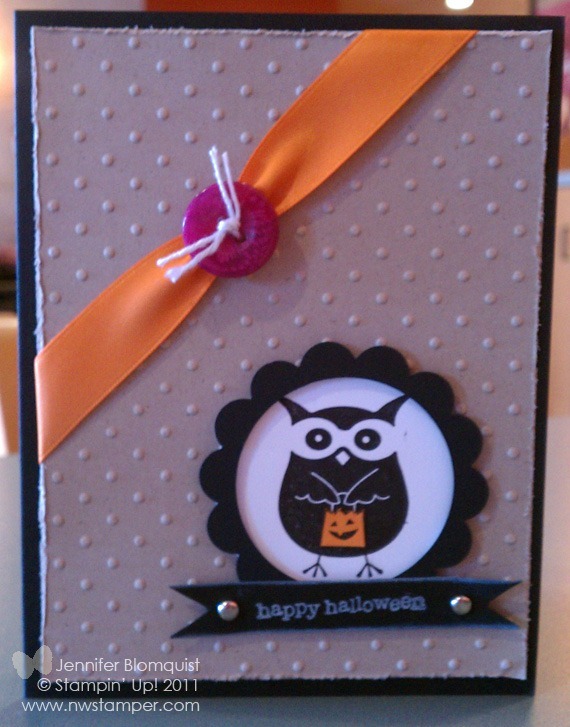 The trick or treat bag held by the owl is actually stamped in black on Pumpkin Pie cardstock and cut out to add some extra dimension and color. And with the Rich Razzleberry designer button, I tied linen thread around the Pumpkin Pie ribbon and through the button holes to help gather the PP ribbon. Then I just used glue dots to hold it in place. This card was fun to make; I may just have to try it for other holidays too! Reminder: The Free BigShot Offer Ends Tomorrow! If you’ve been looking for an opportunity to do what you love, while getting a 20% discount on your favorite products, now is the perfect time! Through October 31st, you’ll get a FREE Big Shot (or $100 in extra free product of your choice) when you join the Stampin’ Up! family as a demonstrator! This is a killer deal and I know I can’t live without my BigShot. Between the starter kit (valued at over $345) plus this $100 offer, you are getting an awesome chance to start your own business, build your crafting stash, or just get one heck of a Christmas present! Just remember, you only have until 11:59 MST tomorrow. Check out all the benefits of being a demo or Click Here to sign up now!